I just finished a lovely quilt that almost had me tearing my hair out. In fact there was a moment when I considered giving the customer her money back because I was unable to create the quilt she wanted. A good night’s sleep and a fresh start along with studying some paintings and photographs gave me the inspiration to continue. My customer wanted a surfer’s wave. She had seen my ocean colors quilts and loved the colors and abstract design. With her wave, I needed a bit more reality or you might not know what it was. My first 8 hours ended with such a bad effort I didn’t even show it to my husband! One of my signature design qualities is sewing curved piecing. This wave, however, pushed me to the limits on curves! Actually it taught me some new strategies to sewing curves too…necessity is the mother of invention. 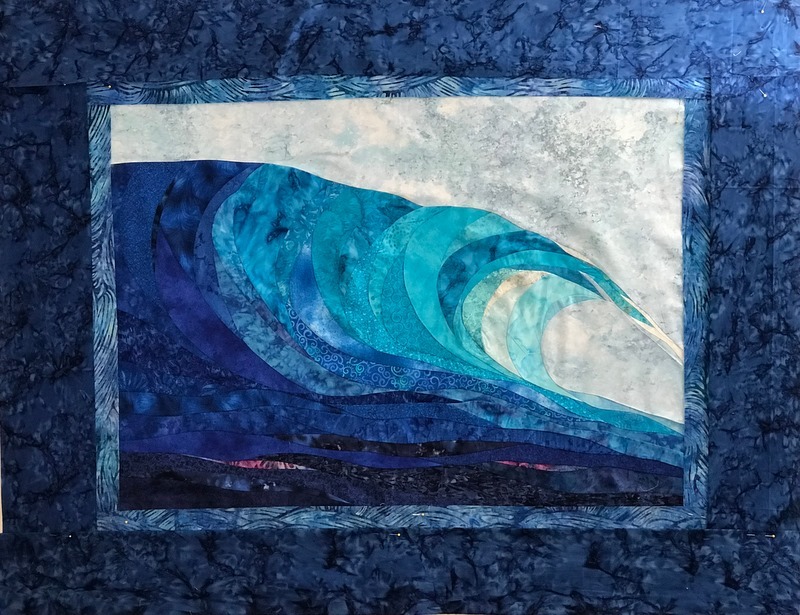 As the curves of the wave became smaller and tighter, I learned to start sewing the pieces together in the middle of the curve, going one direction and then the other, all from the middle. This helped the pieces fit more accurately. I also cut most of these curves with a seam allowance instead of just my wallpaper piecing technique. The latter is a good approach for many curves in quilts but not the tight ones where adding a seam allowance results in a better fit. New ideas from customers give you opportunities to learn new skills. I’m not sure I want to do another large wave but I am happy with the way this one turned out.